Do you want to be a digital nomad? Why not try for a weekend? Digital nomadry seems like the alternative lifestyle everyone dreams about, from startup magazines to office workers in cubicles. With laptops instead of a hobo bag, the nomads of today take remote jobs (usually in the IT or creative businesses), working through technology far away from their hometown. Who wouldn’t want to commute to a beach with just a laptop and a margarita? But is it for real? You can’t charge your phone on the beach, anyway. That’s why you need to try nomadic life for a day before quitting your office job or moving to a tropical town. Just to see if it fits you. Chiang Mai, Thailand, is the best city to experience it. It’s becoming the digital nomad capital of the world, combining lush mountains, hospitable climate (both weather and human), and affordable prices in one neat package. Even if you end up realizing that the nomad life isn’t for you, it’s just a perfect city for a getaway. Saturday Lunch: Northern Thai food, they’re good. When you travel to a new city the first meal is always intimidating. You feel out of place, don’t know how much to trust the guidebook yet. It takes some courage to try the real local food among the locals — especially if you’re by yourself. Don’t worry in Chiang Mai. 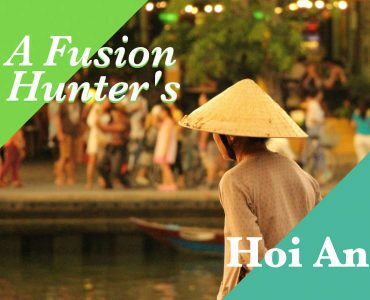 With all the expats, tourists, and digital nomads, you can simply ask anyone, staff or customer, and they’ll tell you what to do and what to eat. That’s the first and easiest step to mingling as a stranger, settling right into the middle of the nomadic herd. The city has the best of northern Thai food, so even if you can’t read the menu, you’re in safe hands. Try khao soi noodle in Lam Duan Faham, or go to Tong Tem Toh. SP Chicken has good chicken in sauce, and Kao Soi Fueng Fah has nice halal noodle with beef or chicken. Checking out some coworking spaces where the digital nomads — solo or as remote teams — go to do their thing. If you really want to try working, go to Punspace. 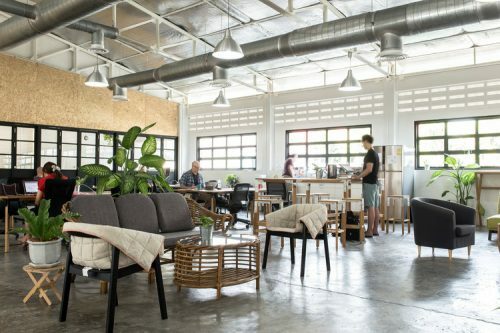 It’s the first coworking space in Chiang Mai, with three locations around the city, and they are known to get the job done. Try Punspace Tha Phae Gate in the old city. It has a startup in a garage vibe. If you just want to have a look to see what it’s like, go to CAMP. It’s on the 5th floor of the modern MAYA shopping center and always popular with local students. CAMP is a cross between a public library and a coworking space. If you will spend more time in Chiang Mai, this mall will become a regular landmark for you anyway. Digital nomads love cafes, coffee being fuel. And Chiang Mai is a city of cafes, hands down. Northern Thailand is famed for growing its own coffee, and Chiang Mai, with its reputation for traditional arts and crafts, has the perfect genes to be a coffee capital. It’s like Melbourne, with tropical jungle instead of beach, temples instead of skyscrapers. 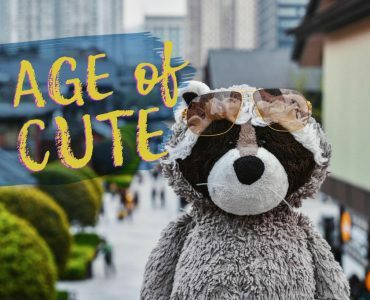 The coffees are reliably good, and you’ll see lots of expats and students (Chiang Mai is also a university city) working or studying in the cafes. Most of the cool cafes are in the Nimman area, west of the old city. It’s fun to cafe hop, but my first suggestion is the Ristr8to — it has excellent coffee and the ambiance is just the kind of studenty-arty air that you expect. If you don’t feel like working or reading, how about more fun studies? Thai cooking is the best souvenir you can bring home, and a cooking school is a great place to make new friends. 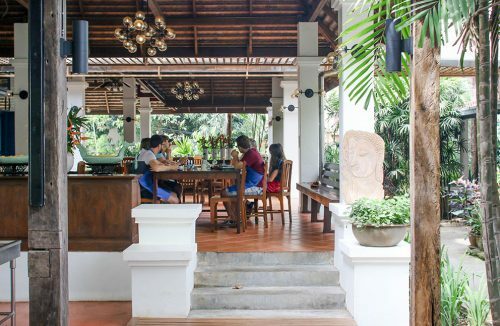 The internationally renowned Thai Cookery School has a team of professional chefs, and Basil Cookery School has a cozier evening session for later afternoon and dinner. Dinner: Go posh. Try the best this city can offer. If you’re not cooking, go somewhere really fancy for dinner. 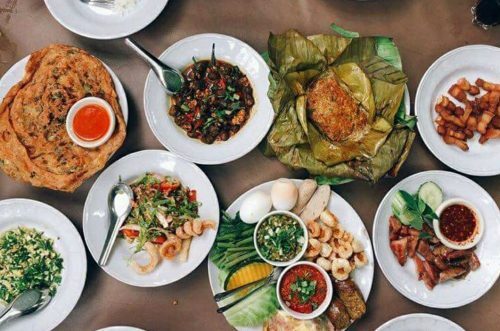 Since most things in Chiang Mai are reasonably-priced, you can splurge and experience a top-notch dining experience with a non-heartbreaking budget. The most famous place is David’s Kitchen, with its established western menu. There’s also a hip spot called The Gallery, mixing traditional art and cuisine. Have one good menu, not too large a portion. 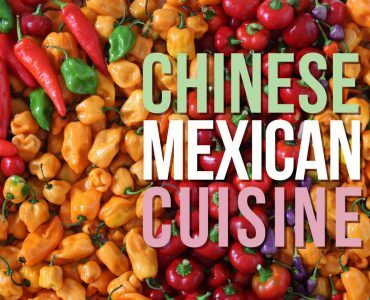 After all, you need to save room, because the night market is filled with yummy street food. As a digital nomad you would get to know it well, but even for a tourist, the Chiang Mai night market is a wonderful attraction. The really fun part is a foot massage in the middle of the market. There are endless meetups for digital nomads and often exhibition launch parties in different galleries. Chiang Mai was designated as a Creative City by UNESCO in 2017. 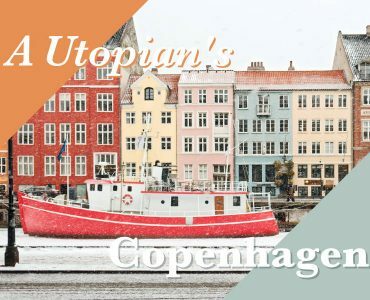 The city is full of social and cultural happenings, and unlike in larger cities, it’s easy to swim into the inner circle. If you’ll spend some quality time in a hotel, 137 Pillars House is on top of its game. 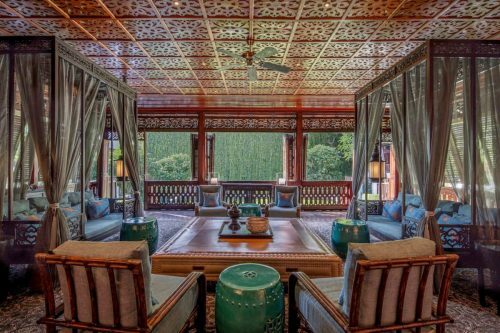 It’s not just one of the best boutique hotels in Thailand, but in Asia overall. The century-old establishment was originally the northern headquarter of the East Borneo Trading Company, once owned by the son of Anna Leonowens, the governess in the King and I movie. This means a rich history and a sturdy wooden structure. 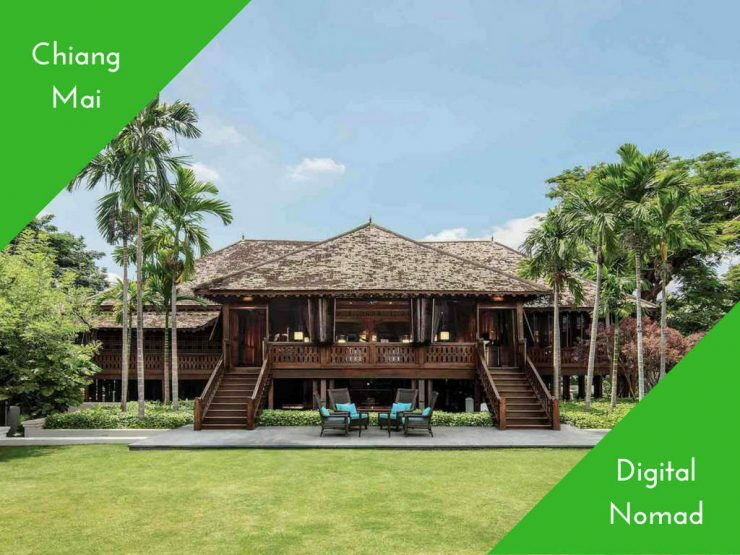 Each of its thirty suites feels like a hidden mansion in a traditional Lanna village, surrounded by lush gardens even though it’s right next to the city center. The only catch is that this boutique hotel has a price tag to match its 5-star status. Other hotels in Chiang Mai tend to be much more affordable, so if you’re just looking for a place to sleep, go to the Shangri La. You’ll be pleasantly surprised at the price, considering the brand name. Whether you stay there or not, I recommend dropping by 137 Pillars House for their buffet. The view of the vertical garden from the exquisite dining hall is breathtaking. Or opt for a Western-style brunch (or just cake and coffee) in a pretty cafe. As a proper hipster city, the brunch scene in Chiang Mai doesn’t disappoint. Rustic and Blue in the Nimman area has a too-pretty-to-eat menu, and GINGER & Kafe on the east side has traditional crafts to browse. The morning is also the time to check out the temples. 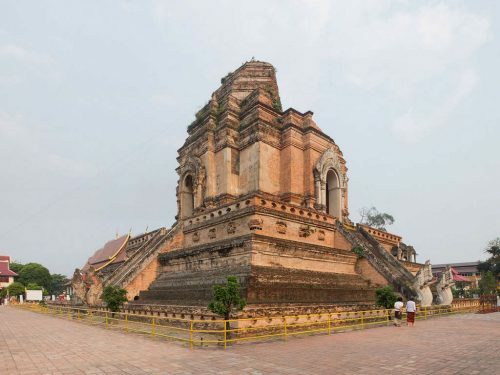 Chiang Mai keeps its tradition well and its temples highlight the best of the Lanna architectural style. For the outdoorsy, Wat Phrathat Doi Suthep on the nearby hill offers wonderful views. Otherwise, visit Wat Chedi Luang in the middle of the old city. The majestic building is almost half demolished by earthquakes, but it remains unforgettable. Walk around it really early in the morning, when there are fewer tourists, and reflect on your life’s decisions. Whether you want to be a digital nomad or not, in Chiang Mai you’ll find yourself in the middle of the spectrum, between East and West, tradition and hipster modernity, students and veteran workers. From that balance, you will feel like you own a small part of Chiang Mai, like it’s your city — as so many other nomads feel.